Le Grand Massif is the 4th largest ski resort in France, and the 5th biggest ski region in Europe, in the Haute Savoie of France near Geneva. 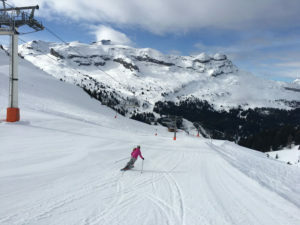 Grand Massif skiing region was founded in the 1980s by combining five existing ski areas – Flaine, Les Carroz, Morillon, Samoëns and Sixt Fer à Cheval. Like its name – its big and massive – Grand Massif has over 165 miles of skiing. Grand Massif is an ideal family ski resort because it is affordable with lift tickets at just over $40 Euro a day. Grand Massif is also “massive”, spanning 40,000 hectares, so its far from a cozy family mountain. The lifts are high capacity to move the masses – it gets busy here – just an hour from Geneva – hosting over 1.7 million skier visits a season. Samoëns is a good locale for skiing with kids, as it features one of the largest dedicated beginner areas in France, and there are numerous fun parks, and kids zone including the Myzterious Forezt of ZiZiPanPan – a themed children’s run ending with a zipline. Grand Massif’s mix of 16 passenger gondolas, six pack chairs, quads and a few pomas bring you to typically two prepared (groomed) marked trails runs – blue and red (intermediate and more difficult). There’s plenty of beginner terrain and family ski zones as well. 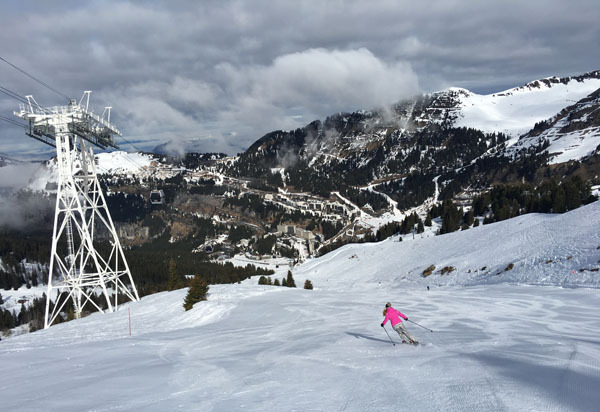 Grand Massif’s longest run is a 14-kilometer ski down from the Flaine summit all the way to Sixt on the scenic Cascades trail – they call it a nature preserve – its like a cross country traverse. From Sixt you need to catch a bus back to Samoëns’ ski lifts, so that ski region is not as well connected like the others. Grand Massif also offers a ton of off-piste above tree line skiing, easy to reach, but equally risky so hire a guide who knows where to go. Staying in historic Samoëns, or Morillon village is our recommendation for charm and apres ski amusement. Flaine is a convenient ski in ski out location, but the architecture is far from traditional alpine chalets – its more like big ski housing buildings – no charm. Similarly, for on-mountain restaurants at Grand Massif, Flaine is bland and unimaginative. The best alpine chalets serving lunch are in Samoëns – La Luge à Téran and L’Igloo for traditional Savoyard cuisine and beautiful views from their terraces, or cozy interiors if it’s wintry out. 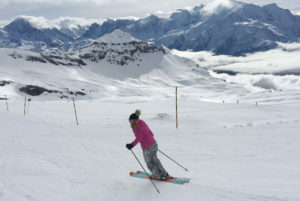 Check out other nearby family ski resort you could include in your French Alps ski tour including Les Trois Vallées – Courchevel, Paradiski – La Plagne and Les Arcs and Espace Killy which includes Val D’Isère Tignes.